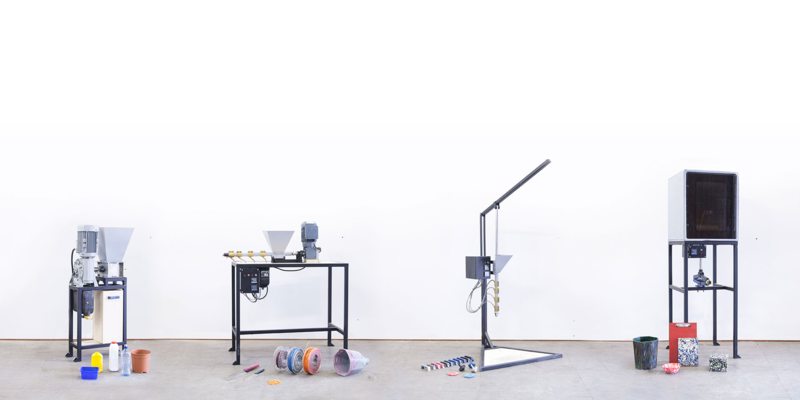 It seemed like a logical progression for 3D printing - recycled plastics - using plastic waste created by the household to print things for use by the household, a bit of 3D printing utopia. Not only is it free but it's super good for your ego / conscience / carbonfootprint / veganmates. It's the kind of stuff that the RepRap community get all worked up over. Unfortunately the project ended up fizzling out as creating content was just too much work for me to do alone, so I never did get to build that extruder, but I did buy most of the parts. Those parts have been patiently sitting waiting to be used. Fast-forward to today (well maybe a week or so ago). I was trying to work out what project I could undertake with my Son to augment a school initiative - climate control. Then I had one of those Eureka moments !! What about recycling plastics and 3d printing something that the school could use. collect the plastic (awareness for littering / recycling / waste segregation). sort the plastics (awareness of plastic types). It ticks a lot of boxes and also integrates several subjects, most of them STEM related. So I decided to do a bit of a google and get some more info on what I needed to finish off the extruder and granulator. I already had a long auger bit and heating elements / temp controllers for the extruder, the casing and hopper were pretty straightforwards. And whilst I was familiar with industrial granulators I had not decided what kind of desktop design to use. So after googling for a while I stumbled across an initiative called 'Precious Plastic' - to recycle discarded plastic and remanufacture it into other products. These guys have taken this simple idea to the next level. They have designed and created commercial grade machines to granulate (shred) plastic, extrude and even undertake rudimentary injection molding, with impressive results too. Started by a fella called Dave Hakkens, his idea was to create easy to build modular machines that anyone could build anywhere in the world. these machines could then be used to recycle discarded plastic into useable products. They could be constructed in areas where plastic pollution was prevalent and then used to help deal with the issue by making use of the collected plastic waste. The entire project is genius really and had an instant appeal to me. Others have obviously felt the same kind of inspiration as uptake has been pretty good with over 100 installations worldwide set up and processing plastic waste into other items. Dave is now working on improvements to the existing systems and setting up new processes to further improve how plastics recycled. His vision is for these plastic processing stations to be accessible to everyone, everywhere. It's hard to convey in a few paragraphs, much better to watch this video that gives a better overview of the machines used in this process. Once you've finished with that video it's worth looking through a few more of the videos on his channel as there's a bunch of interesting stuff going on, from how to make the machines, to techniques for actually manufacturing stuff from them. Whats more, all of the plans for the machines are available for free as they are released under an open source license. This makes it easy for anyone to set them up. In fact they have been designed with simplicity in mind. The thing I love about this is that they can be used by anyone, from surfers making cool stuff in California to people making utensils in Kenya, or even school kids making school utensils from playground waste in Adelaide. So I'm pretty much on board with this idea and think it's a perfect fit for the school project, in fact I think it would be a good thing to get into all schools. If kids are engaged in the process and understand the impact of plastic waste, then they are much more likely to grow into being part of the solution rather than simply adding to the problem. First step is building a functional shredder and extruder. The Precious Plastic shredder plans are really good, and whilst it's a little larger than the original desktop units I was looking at, it's probably a lot more practical. So I've sent the drawings out to get the parts quoted. At this stage I think I'll finish assembling the extruder that I've already started on. It's a little smaller than the Precious Plastics version, but should still function, just at a slower rate. I've also put a couple of websites together so that the kids can track their progress. (another tick in the STEM subjects box). I'll try and keep things updated here too.